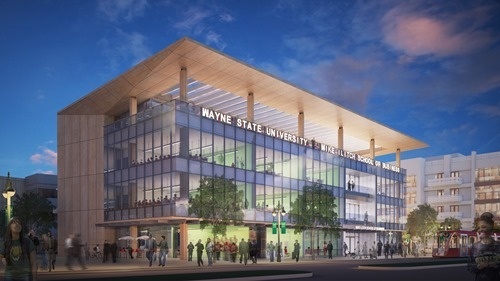 Congratulations, Wayne State! Gartner recently ranked the university's global supply chain management degree program among the top 25 in the nation -- a testament to the exceptional work they've been doing to educate and train the next generation of supply chain management professionals. AIAG is proud to support WSU's achievements in this area, and plans to continue to partner with the university to offer the WSU/AIAG Auto Industry Certificate in Purchasing and Supply Chain Management, and to conduct research as part of the Global Automotive Purchasing and Supply Chain Partnership (GAPSCN). Wayne State University’s undergraduate degree program in global supply chain management is among the nation’s top 25, according to Gartner, a leading industry research company that releases rankings every other year. WSU is a new entrant, included on the list for the first time in 2018 alongside Pennsylvania State, Rutgers, Syracuse, Ohio State and Arizona State universities. Programs are ranked on scope, industry value and program size, with data gathered through surveys and interviews of industry professionals and academics. Offered through the Mike Ilitch School of Business, Wayne State’s program addresses supply chain across multiple industries, with a focus on complex manufacturing in the automotive industry, as well as health care. Nearly 500 supply chain majors learn from nine full-time faculty members as well as high-quality adjunct instructors from the industry, including senior executives from companies like Lear, Ford, General Motors, FCA, and more. Courses include logistics and transportation, purchasing, risk management, manufacturing processes for buyers, production planning and control, theory of constraints, quality management, lean management, and more. The job placement rate for alumni within 6 months of graduation is 85 percent, with 70 percent of those entering automotive careers. To gain firsthand global experience, WSU supply chain students can choose to study abroad through unique, automotive-focused programs in China, Brazil, Central Europe and Italy. Students can also opt to take a purchasing class at Wuhan University in China taught by Ilitch School Associate Professor Tingting Yan. The annual General Motors-Wayne State University Supply Chain Case Competition draws teams from 25 top universities across the country and around the world, including China, Taiwan, Brazil, Mexico and Poland. The 2018 competition will mark its eighth year. In addition to its top-ranked bachelor’s degree program, the Ilitch School offers an MBA concentration in supply chain ­– the largest in the school with nearly 200 students – and recently launched an executive master of science in automotive supply chain management. The department also partners with the Automotive Industry Action Group (AIAG) on a certificate program for industry employees, as well as on research through the Global Automotive Purchasing and Supply Chain Partnership (GAPSCN). The team is currently undertaking a major research project on automotive sustainability practices.